Cut the chicken along the backbone, turn over and flatten the chicken by bashing with your hand. Gently loosen the skin. In a small bowl, combine the the chopped herbs, garlic, ginger, chilli, fish sauce, soy sauce and lemon. Stuff generously underneath the skin. Rub remaining juices onto the skin of the chicken. Season lightly and drizzle with olive oil. Roast on a rack of a roasting tray for 30 minutes. Meanwhile, prepare the glaze. Place all the glaze ingredients into a small saucepan, whisk until well combined and bring to a gentle boil and allow to reduce by half (it should be thick and syrupy). This should only take about 5 minutes. After the chicken has roasted for 30 minutes, generously baste the chicken with a brush and roast for a further 30 minutes, basting 2 to 3 times more while roasting. The chicken should be super golden and caramelised. For the grilled corn and miso butter: Mix the softened butter with the miso, chilli, garlic, ginger, coriander and juice until well combined. shape into a sausage on some cling wrap and roll up tightly. Pop into the freezer until firm. then unwrap and slice. Meanwhile, rub the corn with olive oil and grill on a smoking hot griddle pan. Serve corn with slices of miso butter and allow to melt all over the hot grilled corn. 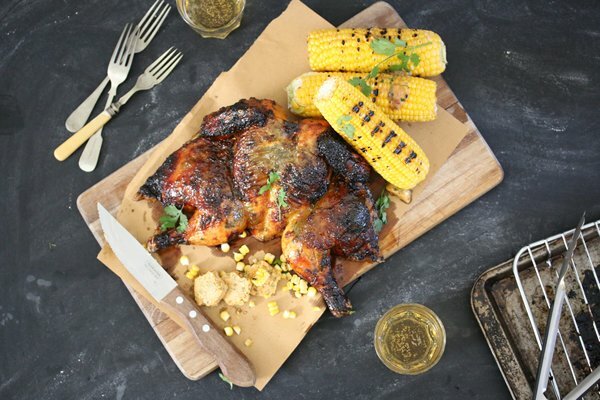 Carve chicken into 4 quarters and serve with the buttered corn.